US President at White House Hanukkah reception: My administration will always stand with the State of Israel. US President Donald Trump spoke on Thursday afternoon at the White House Hanukkah reception. The reception was attended by hundreds of US Jewish leaders. In addition to Trump and his wife Melania, the event was also attended by Vice President Mike Pence and his wife Karen, members of the Trump family and his close advisors. “More than 2,000 years ago, a band of Jewish patriots led by Judah Maccabee reclaimed their freedom from an oppressive dictator who persecuted the Jewish people and ransacked the Holy Temple,” he said. He recalled his visit to Pittsburgh where he met with the local Jewish community following the recent massacre at the Tree of Life Synagogue. “My administration will always stand with our cherished friend and partner, the State of Israel,” he declared. 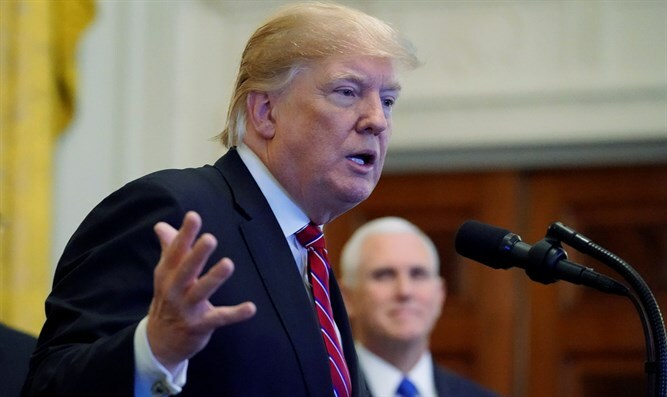 He noted that the US has left the “horrible, horrible” Iran nuclear deal which “should never have been made” and added that his administration has “imposed the toughest ever sanctions” on Iran. “Civilization is indebted to the Jewish people for their incredible contributions to art and science, history, culture and society. Since the founding of America, Jewish communities have uplifted every aspect of our national life. Today we renew our gratitude for those amazing blessings, and we reaffirm our unbreakable solidarity with the Jewish people,” said Trump.